If you are a tiny bit aware of how TVs work, or if you know what you’re looking for, picking out a new TV can be an extremely tedious task. The reason to this is that there are many similar models on the market with only differences being things that might seem trivial to someone that hasn’t mastered absolutely everything there is to know about TVs. Model names often do not mean much, and these devices aren’t advertised as much as smartphones and tablets are, so we are often kept in the dark about what’s „good“, and what’s not. Samsung is known to push out high quality products into the market on regular basis, but their models too differ in functions, life cycle and quality. Samsung UN48J6200 is one of this manufacturer’s new models from 2017, and it boasts some really amazing features and functions. If you are in the market for a new Smart TV, this model is a great upgrade featuring a brilliant 1080p display that’s two times clearer than some previous models. It provides amazing viewing experience in a way that you’ll probably be asking yourself if you are just watching the TV or looking through some window into your favorite movie or TV show. Samsung’s UN48J6200 is one of the better looking TVs on the market today as the extremely slim aluminum frame gives the device a high-end premium look. It’s different from what we got used to seeing as far as Samsung’s TVs are concerned since Samsung often decides to go for a cheaper, plastic look on most their models. 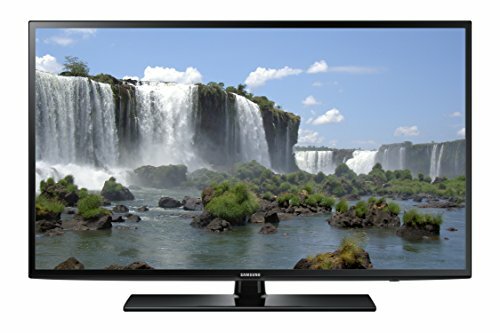 This TV is designed to be a budget TV meaning it is relatively inexpensive for what it does. However, it is important to be aware that “budget” doesn’t immediately mean “cheap”, particularly concerning this brand. This TV is a 1080p screen, not 4K, meaning it does not have all the greatest and latest technologies in that department, but 1080p screen still provides more than amazing viewing experience. Also, 4K is a new technology that is not yet widely supported on the market, so there is only small number of movies, video games, and shows that support this resolution. Whilst 4K may be the future, if you need a relatively inexpensive, high-quality TV right now, you should definitely consider UN48J6200. This TV’s full HD 1080p resolution and vibrant colors will provide you with crystal-clear viewing experience. A Motion Rate of 120 on this TV ensures your TV will keep up with the fast action scenes on-screen. Thanks to its outstanding processing speed, backlight technology and refresh rate, this TV is able to deliver a seamless moving image. Moreover, a Wide Color Enhancer allows this TV boost all colors, providing you with life-like and vibrant picture. With this TV, you’ll never lose sight of all your current entertainment, since the fun-to-use and great Smart TV menu bar is right at the bottom of the screen providing you with truly intuitive, smoother, and faster access to all the content you are interested in. You no longer have to fumble around looking for the content you want since this Smart TV remembers your history, and places the content you most frequently use on the menu bar right before your eyes. You are even able to discover new, exciting kinds of content since the Samsung UN48J6200 continuously recommends new, fun featured content that you might enjoy. We must also mention how easy and fun is to connect this Smart TV to your mobile phone. This allows you to easily open up a whole new world of entertainment as well as useful features which can make things a lot easier. For example, your TV can wake up the same time you do, with all the information you need in order to start your day right, like the weather and your schedule.